These Dotson / Getz, Pine Island coastal polynyas are big! The Dotson / Getz polynya has a perimeter ~800 km and an area ~25,500 km2. 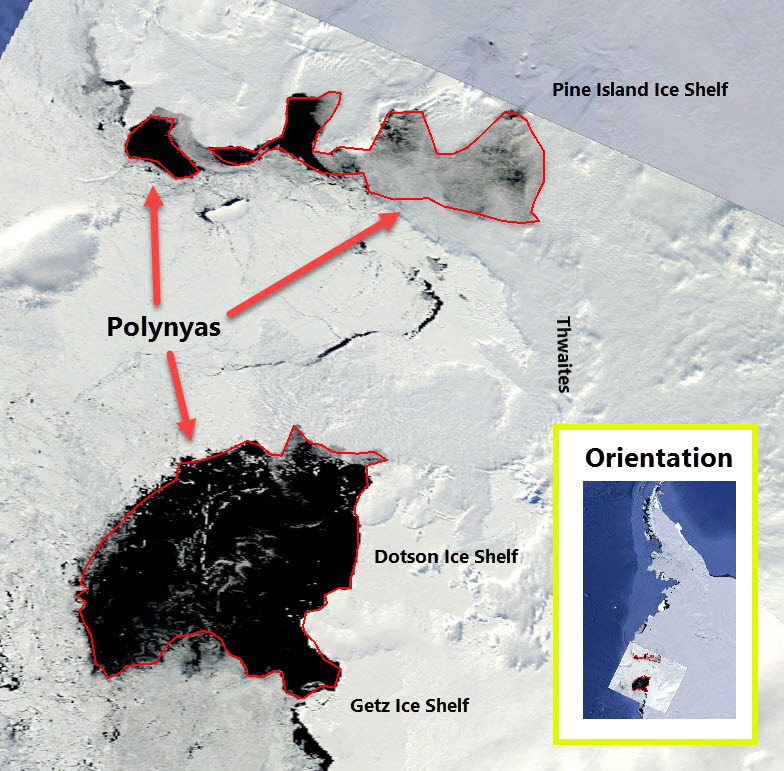 The Pine Island polynya has a perimeter ~770 km and an area ~10,800 km2 . The smaller polynya top left has a perimeter ~170 km and an area ~1,300 km2 . The total polynya area is ~37,600 km2 . It is still early spring in Antarctica and it’s still cold. Surface temperature in °C, Antarctica 11 October 2016 from Automatic weather stations. The white box is quite close to the polynya. With air temperatures of -15°C and ocean temperatures at ~-2°C, from my post about the sensible heat loss in the Arctic we could expect a sensible heat loss from the ocean of between 100-300 Wm-2 depending on the wind speed. At 200 Wm-2 the sensible heat loss from the ocean in these polynya is about 7.5x1012 W.
And it means this part of the Southern Ocean is losing a lot of heat. But overall it is still just a small part of the natural climate system. There are a lot of other things going on in this region of the West Antarctic Ice Sheet, and it is a big current research focus. Dr Bethan Davies wrote an excellent Pine Island post on the importance of the region on her great website antarcticglaciers.org. We know for example the glaciers feeding this part of the ocean have sped up. Decline of West Antarctic Glaciers Appears Irreversible. NASA. 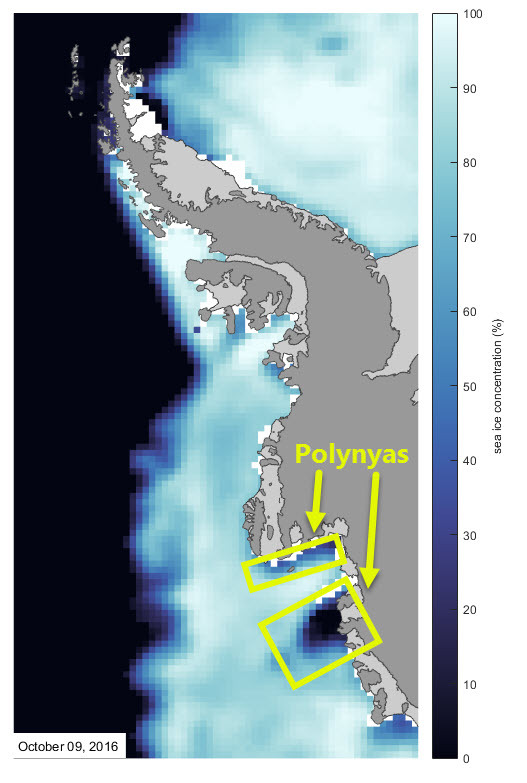 Polynya areas approximated in the yellow boxes. And this has caused led to many changes in the West Antarctic Ice Sheet interior. For example Prof Mauri Pelto wrote a great blog post about the retreat of the Smith Glacier which feeds the Dotson Ice Shelf. It is also an area where a while ago I wrote in Recent Amundsen Sea Embayment Research, about the very interesting hydrology beneath this part of the West Antarctic Ice Sheet. 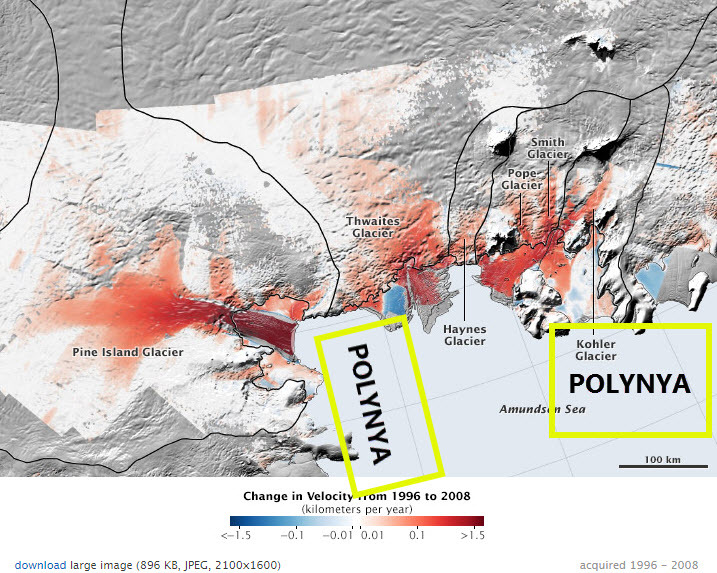 On my list of things to do is see how long these polynya have existed for.